The Reimagining Wordsworth project will see the museum expand and modernise to celebrate the 250th anniversary of the poet's birth. A community group in Penrith is bidding for almost £2 million in lottery funding to restore Castle Park in the town. The money would be used to make the playground and obstacle golf course bigger, refurbish the Memorial Gate and Black Angel War Memorial, and build a car park. A level bridge would be built across to Penrith Castle, making it more accessible, and a water feature next to the cafe would be reinstated. The total cost of the potential project would be £2.46 million, and the bid has been developed by the Castle Park Development Group with support from Eden District Council. I feel we have put together an application which demonstrates the public’s desire to see improvements at Castle Park and which reflects its history and heritage. I sincerely hope that the application is successful to enable us all to move on to make the improvements happen. Heritage Lottery Fund will announce if application has been successful in July 2017. A disused 19th century railway is to be transformed into an industrial heritage arts trail thanks to a £50,000 grant. The project, funded by Heritage Lottery, will aim to help unravel the history of the iron railroads in Moor Row, near Whitehaven. A second building in Whitehaven is set to be renovated as part of Copeland Borough Council's Townscape Heritage Initiative. A bid for Lottery cash to fund a new archive centre in Dumfries has been turned down. Dumfries and Galloway Council applied for £2.7million from the Heritage Lottery Fund (HLF) but the application was rejected with the HLF citing intense competition from around the UK as the main contributory factor in the failed bid. But council bosses say they're investigating alternative funding options and determined to press ahead with plans for a new archive centre that will be based at the Ewart Library site. “A new archive centre for Dumfries and Galloway is long overdue and something that our council is committed to providing for both the people of the region as well as visitors to the area. The proposed centre is set to hold over 6km of records and will increase public access to archives and local studies as well as aiding the regeneration of Dumfries town centre. A group of young musicians in Cumbria has received funding from the Heritage Lottery Fund for a project that will see them create digital resources for local museums. Buejam Arts, in Penrith, has been given a grant of £27,000 to help create videos and accompanying soundtracks inspired by local stone circles. The Stone Mass Project will produce four films that will then be showcased at events at Penrith Museum, Rheged IMAX and the Alhambra Cinema throughout 2015. Those producing the videos will research the history and myths and legends surrounding Long Meg and Her Daughters, and other Neolithic sites in the area. Dumfries and Galloway Council is confident the regeneration of Stranraer town centre will go ahead, despite missing out on funding. Bids were made to the Heritage Lottery Fund, and Historic Scotland, for grants to help the £3.5 million project. But the high level of competition for the funds means the council has been invited to resubmit its application in August. The council remains committed to spending £1 million on the regeneration. "It’s very frustrating that funding has not been approved at this stage due to the sheer number of applications and the competitive nature of the process. "However, the HLF Scotland team supported our application and both they and Historic Scotland recognise the proposed improvements as an excellent project. "The Council has been encouraged to resubmit our applications by HLF and Historic Scotland, so we will continue to try to secure external funding. Watch Tim Backshall's report on the plans for a multi-million pound teaching and learning centre at Carlisle Cathedral. The Very Rev Mark Boyling says Carlisle Cathedral's Fratry project will bring the stories of the precinct to life. 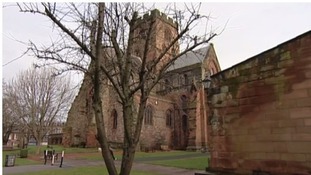 Plans to create a multi-million pound heritage teaching and learning centre at Carlisle Cathedral are back on track. The Heritage Lottery Funding has confirmed initial funding of £81,000 for its plans to develop world-class facilities in the Fratry building inside the Cathedral precinct. This grant means work can now take place to complete a new building design, and should lead to a second grant application of £1.8 million from the HLF within two years.